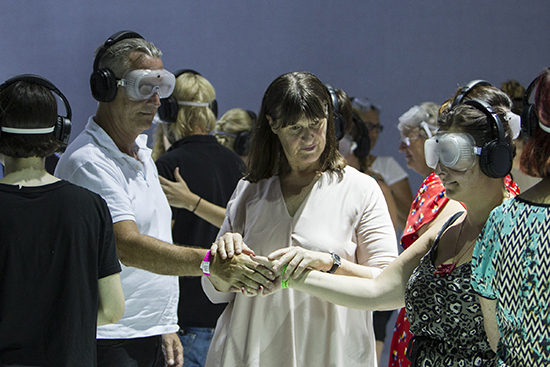 Two works encountered in the first week of the 2017 Sydney Festival, one effecting sensory deprivation in its audience, the other demonstrating causality itself through the dancing body, provoke the question: how does live performance touch us? “Will I be all alone?” Michelle Stevens had wondered when, some years before, she began to lose her hearing. She was already blind, but she had a constant companion—the solace of the piano. And then she found herself sitting next to Heather Lawson, who is deafblind, and a dialogue and a friendship began. In a survey prior to attending Imagined Touch (a good preparation for some new rules of engagement) I ticked the box that said: “I use my eyes to see and my ears to listen.” Part-way into the performance, donning the goggles and headphones supplied and guided by unseen hands from my seat, I too wondered if I would be “all alone.” I am a stranger in a strange land, stranded in empty space, the usual primacy of my visual and aural senses upended. Knowing there would be sensory deprivation, I was expecting complete darkness and silence. Instead, a milky diffusion of light and shadow and a barely audible sound score of haunting keys and electronica, later merged with Stevens’ live piano, allowed an otherworldly immersion, a heightened sensory embrace in this work’s generous installation. I was invited to dance, to change speed and levels, to walk alongside another or to simply be with myself. As in the reality of those who are deafblind, we the audience are thrown upon a reliance on smell and touch, on our innate sense of balance and geo-location. It is a rare experience in theatre or live art to be so directly invited into a semblance of another person’s life experience. Here, with the elevation of my own haptic sense, I notice how clumsy many of us are with our sense of touch. Although it is arguably our first, most pervasive and ever-present sense, touch is often in the shadow of our ‘normal’ navigation through a world saturated in optical and aural information. But I’ve skipped ahead. Imagined Touch opens on a bare stage with two performers and two chairs. Red velvet curtains lend a sumptuous air of cabaret, a vaudevillian simplicity that complements the warmth of Lawson and Stevens’ presence and their direct welcoming address to the audience. They set a playful tone, checking us out, “looking for a hot guy” among us. But as both are deafblind, and only Stevens speaks, they occasionally need assistance. Their interpreters appear instantly as needed (and just as quickly fade into the background). What follows is a breathtaking sequence that could be a multilingual summit at the UN. 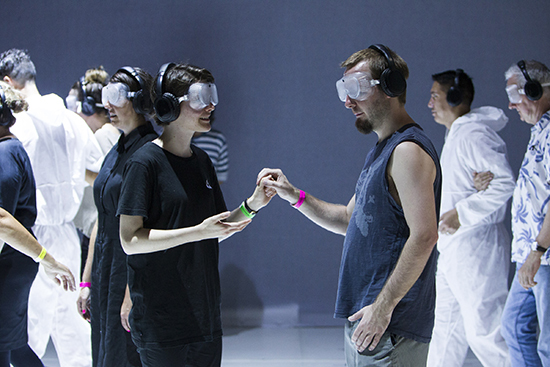 Performers and interpreters communicate in a mixture of Auslan English, a tactile version of signing where two speakers touch hands, and a newly developed mode that involves drawing on each other’s backs (reminiscent for me of a school yard game). The rapid-fire exchange is confounding, funny and beautifully choreographed. For Heather Lawson, already deaf, losing her sight was like a “dimmer switch” slowly turning the light level lower. She loves to dance, to dive, to feel the force and compression of air on her body. My impression is that air and vibration can be, for her, like light, like melody, poetry, composition. Towards the end of the work, after she had danced, liberated in the space while Michelle Stevens played piano, her thoughts are projected onscreen: “It’s about being here…I’m here. You’re all over there.” Except for me the separation between us all had diminished in a gut-wrenching illumination of our difference and connection, a testament to the work of a truly exceptional collaboration under the direction of Jodee Mundy. Dancenorth is a well-regarded regional company with a 30-year history. 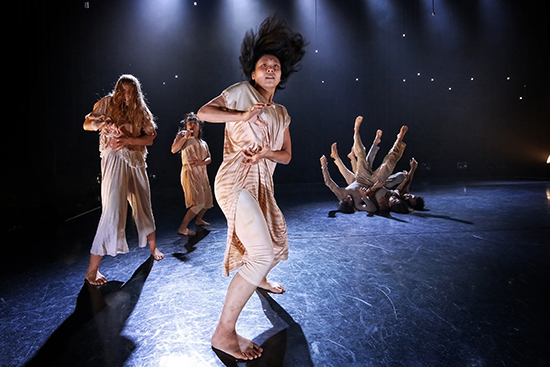 Currently they have a small troupe of fine dancers and Artistic Directors Kyle Page and Amber Haines have reputedly shown both performance and choreographic brilliance in pursuit of their interest in causality and other mysteries of human existence. I gather from the program note that Spectra is a Buddhist-influenced study in cause and effect, the endless chain of action and reaction. A rope flicks, the dancer moves; one dancer touches, the other responds. That sort of thing. Fair enough. The dancers are skilled. I have hope, patience and some expectation. However, some way in, I grow dissatisfied at the number of times there is a set-up, an entry or movement phrase that suggests a deeper development (or causality) to follow. The ideas ebb away or are abandoned too soon. To give an example: the dancers join arms and transfer a wave of movement back and forth, then lift their conjoined limbs above their heads to resemble something like the buttress roots of a giant fig tree. Ah! I wonder where they will take this striking organic formation. But it dissipates, rather than manifesting the potential energy of the image. Likewise, later in the work, Japanese dancer Kie Teranishi appears upstage, arms extended, as though electrified in a shaft of white light. The other dancers form a huddled horseshoe at her feet while she stands charged and still and then shudders as though struck by lightning. This heightened Butoh-esque moment, redolent of an operatic tragedy, held a promise for a strong trajectory or energetic arc. I tried to make sense of where this moment had originated and how it related to what came after, but was at a loss as it dissolved without any satisfying denouement into yet another sequence of swirling hybridised group choreography. Perhaps I missed something pivotal that held the key to this collection of sequences? All this left me with a feeling of having watched a series of disconnected episodes and solos held together by the strength of Niklas Pajanti’s lighting, Tatsuo Miyajima’s spare installation (which includes a suspended multiverse of light bulbs) and the continuity and nuance of Jiro Matsumoto’s live sound environment. Unlike Australia in the 80s—when we were first exposed to the strange intensity of Butoh with performances by Kazuo Ohno, Sankai Juku and Body Weather performer Tess de Quincey—these days artists, choreographers and companies looking for new influences, new approaches to the body and movement, have far easier access to cross-cultural collaboration. But sometimes the resulting explorations, like this one, where contact improvisation meets hip hop meets Butoh meets breakdance meets something like Mark Morris’ endless curvings, can become a stylistic soup where the potency of each distinct form becomes bland; where compulsion and necessity (be it conceptual or physiological) are sacrificed for a product diluted for public consumption without achieving any deeper interrogation.. I have no doubt that Page, Haines and Dancenorth will continue to make compelling work, in this case bringing together a melange of styles and influences with a hint of drama, if lacking an empathic entry point. The parts of Spectra remain greater than their sum.